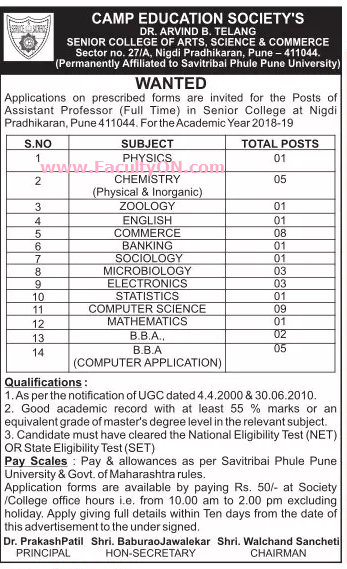 Dr.Arvind B.Telang Senior College of Arts Science Commerce, Pune has advertised in the LOKSATTA newspaper for the recruitment of Assistant Professor jobs vacancies. Interested and eligible job aspirants are requested to apply within 10 days from 26th July 2018. Check out further more details below. About College: Camp Education Society has been established in 1885 by Rajanna Lingu Polas, Balkrishna Sayanna Motadu, B. Dastur, Dorabji Booty, Gangaram Bhau Mhaske and Mahatma Jyotiba Phule along with other socially committed people, to create social awareness and to spread the light of education for socially and financially backward sections of the society. The society takes pride in the fact that noted social reformer and educationalist Acharya Atre worked as Head Master for Camp Education Society for about two decades.